Saturday Night Live cast member Kate McKinnon sat down with five other television comediennes and the Hollywood Reporter this week for a wide-ranging discussion on comedy, television shows, sexism, the downsides of fame, and the presidential prospects of Hillary Clinton. McKinnon, who will play Hillary on the sketch comedy show for the foreseeable future, or at least until the election, told THR that she feels “immense pressure” stepping into the candidate’s shoes. Of course, Saturday Night Live cast members playing versions of real-life politicians they support in real life is nothing new. Back in 2012, lead SNL writer Seth Meyers told Bill Simmons that the show mostly stuck to “straightforward” impersonations of President Obama while going over-the-top with their Mitt Romney and Sarah Palin caricatures. And in an interview with the New York Times the same year, just before the election, Lorne Michaels said the show still had not found a comedy “hook” to lampoon Obama with. One need not go that far back for another example of Saturday Night Live playing softball with President Obama. “I loved that, and thought it was so powerful and just incredible,” Strong gushed of Colbert’s performance. One would think that Strong, having been such a fan of Colbert’s down-and-dirty, take-no-prisoners approach, would use some of her own biting humor to genuinely take President Obama to task on a night generally reserved for frivolity and back-patting. SNL has since found ways to jab at Obama, most notably in a skit about his use of executive orders. But the ribbing came only after the president was safely reelected. 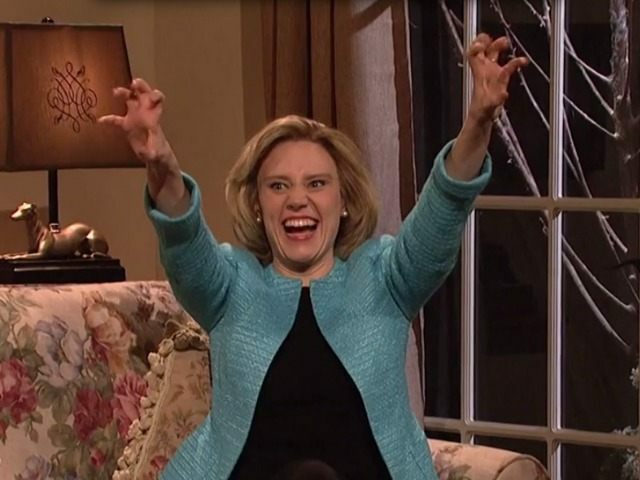 Now that we know McKinnon is “rooting for” Hillary, and has a place in the SNL writers’ room, it shouldn’t be too difficult to predict that most of the heavy-duty swipes at Hillary will come safely after the 2016 election. That is, if the show can survive that long; the 40th season finale, hosted by comedian Louis C.K. with musical guest Rihanna, drew a tepid 1.8 rating among adults 18-49, good enough to tie with the Bill Hader-hosted October episode for the lowest key demo ratings in the series’ history. SNL is facing something of an identity crisis in its upcoming 41st season, and the show’s producers ultimately have two options: they can either stay the course with low-risk, low-reward satire, or they can refocus on the equal-opportunity-offending, incisive humor that led to legendary skits like this one.